I think Santa Claus will need a James Bond style sled tonight – one which converts into an amphibious vehicle to cope with all this rain and flooding. The weather is proving to be most unseasonable, but the mince pies are baked and the house smells deliciously of cinnamon, cloves, star anise and ginger from the spiced biscuits and braised red cabbage. The presents are all wrapped and spilling out from under the tree and the first round in the Welly household Christmas board game challenge has commenced. I’m just about to mull some cider and settle down with my seed catalogues and start the agonising process of deciding what I want to grow next year, followed by the slightly tortuous stage of working out what I can actually fit into my growing space. Still, it’s fun poring over all those glorious images and dreaming of summer. And if I start now I might be ready to put in my orders at some point in January. Whatever Christmas means to you and however you choose to celebrate I wish you a happy, peaceful time, and for those of us in the northern hemisphere there’s the knowledge that spring is creeping ever closer. I’ve always had a thing for Scandinavia. I’m not sure where this comes from but ever since I can remember it’s held a deep fascination for me. Our honeymoon was spent in Norway. Neither Wellyman nor I have complexions suited to tropical climes so we chose fjords and mountains rather than desert island beaches. If you gloss over the eye-watering prices and the fact that we spent a night in bunk beds in a youth hostel Scandinavia was everything we thought it would be. My love of all things Scandi hasn’t abated. I can highly recommend the book The Almost Nearly Perfect People, The Truth About The Nordic Miracle by Michael Booth which is an intriguing look into why the inhabitants of the Nordic nations regularly top the tables of the happiest people on the planet. It’s also at this time of year I wonder how our friends across the North Sea cope with the long winters. For me it’s a tricky time of year. My body and brain crave a break from the garden to recharge my batteries. I even like the changing seasons. I’m not sure what it would be like to live somewhere where it was sunny all the time and there was no autumn or spring as we know it, but I do know I’d miss the first leaves unfurling, snowdrops poking through, the autumnal harvest and leaf colour. Oh, but the long dark nights and the gloomy days make everything so much more of an effort. Perhaps if I lived somewhere where snow glistened under sparklingly clear winter skies I wouldn’t mind winter so much. Instead Welsh winters tend to deliver damp and grey. Farrow and Ball might have done much for the colour grey’s reputation, rebranding it from dour to trendy with names like ‘Skylight and ‘Mole’s Breath’, but so far no one has managed to convince me of the merits of dampness. And whose bright idea was it to come up with the name Seasonal Affective Disorder? Yes, I know it sums it up rather neatly and produces the acronym SAD but no one who approaches the lack of light with trepidation wants to refer to the lamp which is a pretty poor substitute for the sun as their ‘SAD lamp’. Even the act of calling it that makes me long for spring sunshine. Embracing the Danish idea of hygge is one way to deal with winter. After much consultation online I was still none the wiser as to how it’s pronounced – Søren (Flaneur Gardening) can you help? It can’t be translated directly into English but it roughly means cosiness, taking pleasure in the simple things in life such as gathering around a roaring fire, enjoying a steaming bowl of soup, lighting candles, snuggling under a blanket. This is all right up my street. It might be why I love Christmas so much. I know it’s not the done thing to put decorations up too early. Obviously there are the practicalities of keeping a Christmas tree alive for a long period of time in a centrally-heated home. But there’s most definitely a judgemental attitude to when it is deemed acceptable to adorn your home. I’m certainly not opposed to anything – candles, twinkly lights, a sparkly bauble or two – which adds a bit a glam to the house as the nights draw in. Our ritual has always been to restrain ourselves in terms of the tree and full on decorations until the 1st of December. I know for some Christmas Eve is too early! 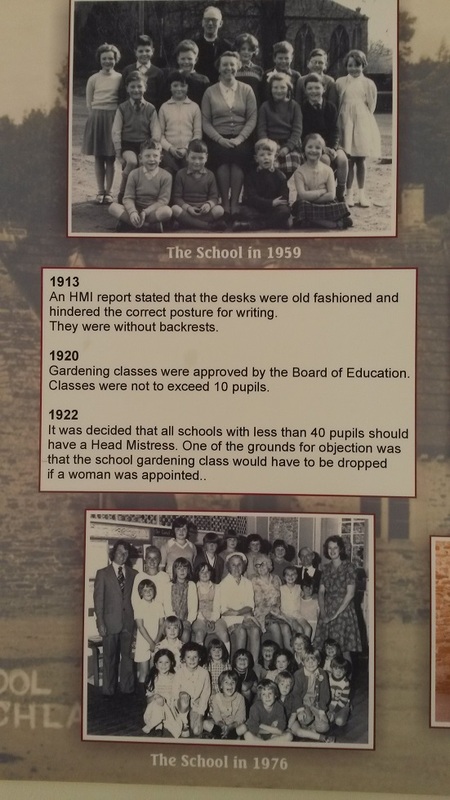 Spotted this on the wall of an old school at the weekend. A woman could apparently be a headmistress but not run a gardening club. So imagine how I felt when I was asked to make some Christmas decorations for a magazine and that they’d need a tree, lights, the works. Eek! So Christmas came to the Welly household on the 12th of November this year. We collected a tree from a nearby farm – it was the earliest tree he had ever sold in twenty years of business. There were slightly startled looks and ‘we thought we were early’ comments from other visitors to the farm. They were choosing their tree for collection later on, as we walked off clutching a sawn-off tree and huge branches of noble fir for the wreath making. I’ll admit it was a tad disorientating to have a fully dressed Christmas tree, mince pies and mistletoe in the house in the second week of November. I did have to pinch myself as I was making the decorations. I was an avid Blue Peter viewer as a child and would make the Christmas decorations they featured every year. To be able to come up with ideas and make them for magazines myself is a dream come true. It was a short-lived burst of festive spirit. Even though we picked a Nordmann non-drop tree we didn’t want it to look forlorn by Christmas Day so it’s having a break from the central heating and it’s in the garden at the moment, tucked away in a corner, where it has so far survived the battering of the Atlantic storms passing through. I didn’t want to take everything down though so we still have lights, baubles and candles dotted about adding sparkle to the house. We had a surprisingly early taste of winter last weekend. We were visiting family in the north-east when an icy blast of weather from Iceland was forecast. There was the lightest of dustings of snow in the garden on the Saturday morning but I knew that the higher parts of the North Pennines would certainly have more, so we set out to hunt for snow a bit like those storm chasers in America. We headed north to the fascinating village of Blanchland, built from the remains of the 12th century abbey. There was a good inch of snow and the paths were lethally icy under foot and it all looked enchanting under the blue skies. It was apparently -11°C with the windchill and the kind of cold that makes you feel like the air has been sucked from your lungs. It was quite a shock after such a mild autumn to go straight to winter like this. After lunch in front of a roaring fire we drove north to the pretty market town of Corbridge on the banks of the Tyne. From here there’s a road which takes you south over the very tops of the North Pennines, the spine of northern England. Sparsely populated with small villages of sturdy stone cottages and farmhouses, it’s a stunningly beautiful but little visited part of the country. It’s hard to imagine now but this was once a hub of industry. Mining for lead and other minerals was the main employer. Every now and then you’ll spot a cluster of buildings, remnants of the area’s industrial past and at Killhope there’s a restored 19th century lead mine, working water wheel and museum. It was on this stretch that the snow was at its deepest. It was a magical scene from the warmth of the car but a reminder that it must have been an incredibly hard place to live before central heating and electric lights. It was a short-lived blast of winter and now we’re back home we’ve returned to the grey and damp, but it’s December in a few days and I can’t wait to indulge in some hygge. A wet August has made for a decidedly sodden garden and allotment, and at times a soggy gardener. I wouldn’t have minded so much if it was just drizzle but it has been the sort of rain, those big fat drops, which soaks you in minutes. I’ll admit I’m a bit of a fair weather gardener. It’s the cold that mainly makes me retreat indoors. Rain doesn’t bother me so much, particularly if I’m prepared and wearing full waterproofs, even if I do make a passing attempt at the ‘trawlerman off to sea’ look. The problem with gardening when it’s wet is the mess that results. It’s impossible to not end up looking like a creature from the deep or like I’ve spent the last few hours bog snorkelling rather than gardening. Or is this just me? Weeding is initially quite pleasurable as dandelions and thistles with long tap roots slip from the rain-softened earth so much more easily than from sun-baked soil. It’s not long though before I’m covered in mud. Using the trowel or hoe elicits a squelching noise from my rain-soaked gloves as another weed is removed. Deadheading isn’t too bad but then the petals and leaves stick to me. I trimmed my yew topiary cones by the front door last week. The forecast promised wall to wall sunshine and little chance of rain. The yew needed taming. It had taken on an unkempt shagginess which meant it was no longer possible to distinguish any real shape. I wish I hadn’t planted them in the first place. Clipping them, although a task only needed to be done once a year, has become a chore. One of those jobs I’ll put off until I have to accept I need to do it or we won’t be able to get to the front door. Of course the wall to wall sunshine included a series of heavy downpours – it’s been that kind of summer. I sheltered in the hall during these cloud bursts but each time I returned outside the soggy yew clippings would cling to everything – me, the shears, the path and the brush. Much muttering about stupid yews and their annoying need to grow and chastisements of the inexperienced gardener who planted them 8 years ago ensued. I absent-mindedly left the shed door open last week. The next morning it looked like a torrent had streamed through it. A neighbour asked if I’d heard the storm that night. I sleep with ear plugs in so had been oblivious to the deluge the heavens had deposited on the village. At least showers have replaced incessant rain. In the intervening dry spells I have been trying to get as many garden jobs done as possible. Hardy annuals have been sown, biennials are in their final homes on the cut flower patch, the plot has been weeded and the box balls no longer look like shaggy hedgehogs. All this means I can go off for a bit of a break knowing everything is as it should be, well, for a couple of weeks at least. So it’s finally here. The Crafted Garden is published today. It’s an exciting and nerve-racking time. I’ve had some lovely feedback already which is always a bit of a relief. 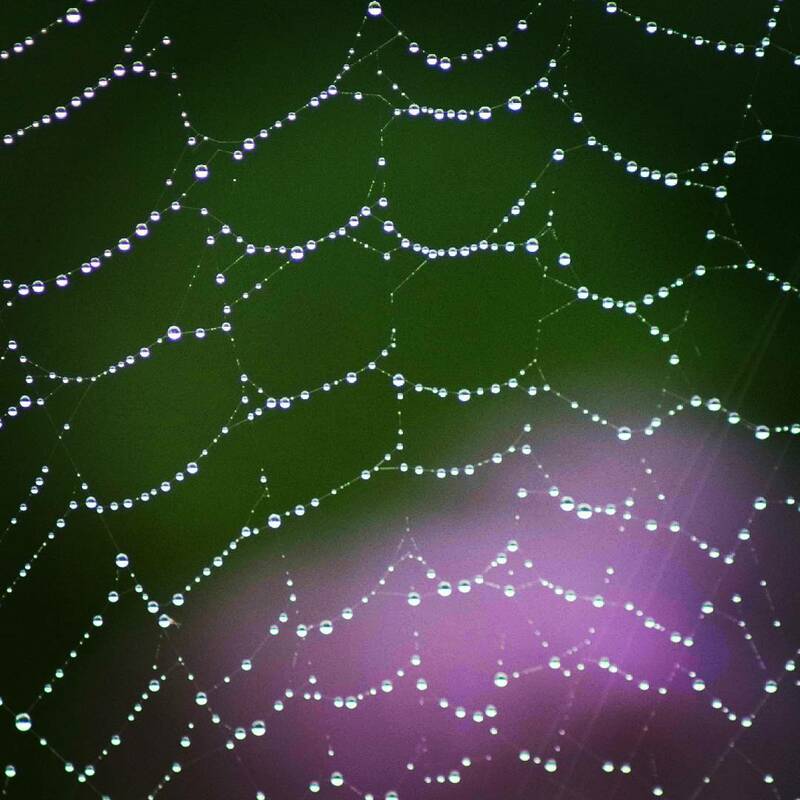 I really hope if you get a chance to read it you’ll feel inspired to try some crafting using nature. 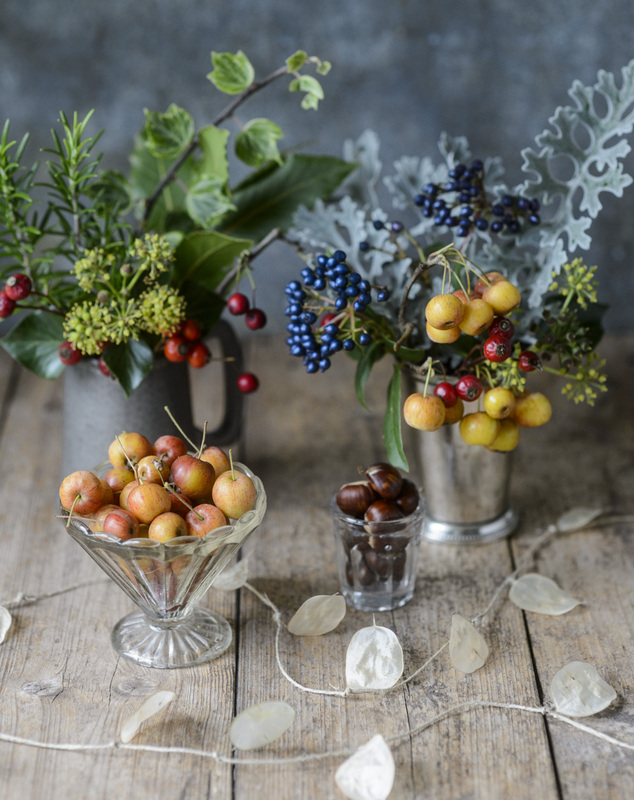 Whether it’s simply collecting a few bits and pieces on a walk and creating your own nature table at home, making natural wreaths or finding ideas for home crafted Christmas decorations. Even if crafting isn’t your thing I’ve included some fabulous garden-worthy plants that will make great additions to any green space and there are tips along the way on how to grow a variety of plants. And of course, there are plenty of flowers. The Crafted Garden is available from bookshops and online, or you could take advantage of this special discount price. To order The Crafted Garden by Louise Curley at the discounted price of £13.99 including p&p* (RRP: £16.99), telephone 01903 828503 or email mailorders@lbsltd.co.uk and quote the offer code APG355. A heavy envelope which felt like it had books in it arrived the other day with the postmark of my publisher on it. It’s funny how after nearly two years in the making, and the pulling teeth process of editing which can make even the most committed of authors fall a little out of love with their book, the excitement is still there when you see all that work come together for the first time. It’s not as if the content comes as a surprise, you spend hours in front of a computer writing the words, there’s the time coming up with the ideas, in my case growing the plants to provide the material and there’s the photo shoots. Finally there’s the editing process. Time spent working with your editor and the designer marrying the photos and text together, and the juggling of it all to fit the layout and design of the book. Weeks and weeks of looking at PDFs and going through edited text can strip you of most of the passion and excitement you had when the book first started to form as an idea. Fortunately there is a breathing space when it all goes quiet, the emails from the publisher stop and you return to a life no longer dictated to by your book. You stop waking up early, usually with a sudden jolt, worrying about whether you’ve spelt someone’s name correctly in the acknowledgments, or whether you remembered to send that urgent email about the photo that’s in the wrong place. Several months later the emails start again – publication date is drawing closer. Then a package, a book-shaped package, arrives and that excitement you felt all those months ago when you first starting working on the idea returns. It’s a little odd seeing all those long hours, the frustrations but also the fun times, staring back at you in book form. It’s a team effort to bring everything together and it was a delight to work with the very talented team behind my last book, editors Helen and Joanna, photographer Jason Ingram and designer Becky Clarke. Wellyman is also rather chuffed that some of his photos have made it into the book too. The Crafted Garden brings together my love of gardening, crafting and nature. For me these three loves go hand in hand. 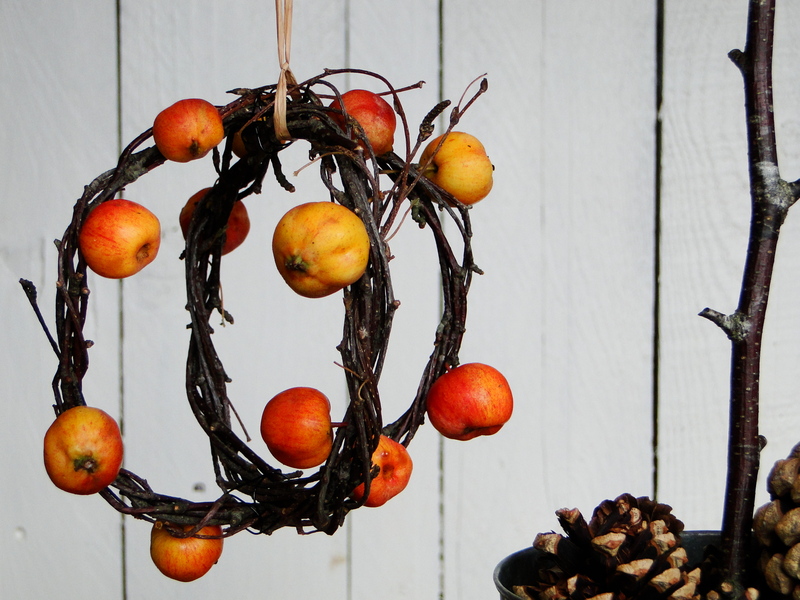 Why buy a fake wreath to adorn your door when the natural materials to make a gorgeous seasonal wreath can be grown so easily in your garden or foraged from the hedgerows? 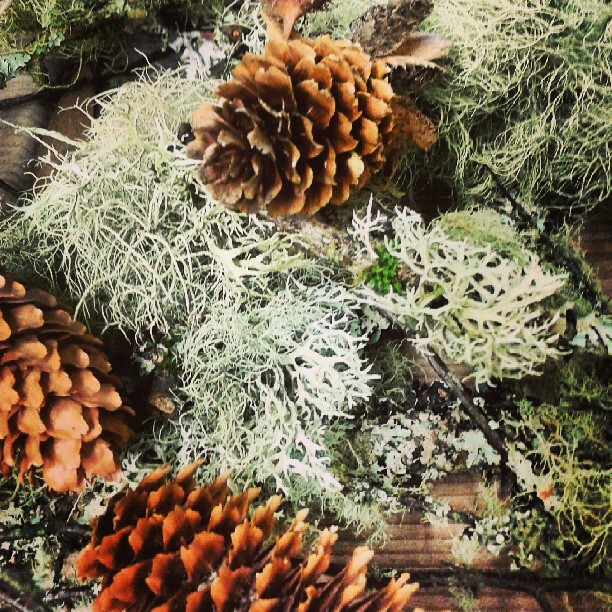 Why buy Christmas decorations shipped in from the Far East when simple ways to festoon your house can be made from cones, lichen-covered twigs and evergreens collected on a winter woodland walk? They can be thrifty, fun to make, connect you and your home with the seasons, and they can be composted when the New Year arrives. I think more and more people have grown tired of mass-manufactured products that have little or no charm, made in vast factories and shipped from the other side of the world in massive container ships. Many of us are rediscovering the pleasure in making our own or seeking out skilled craftspeople who make bespoke pieces. I think this is all a bit of a backlash against the homogeneity of the high street. Being creative is also good for us. Neuroscientists are looking into how creative tasks impact on the brain. It’s believed it can have an impact similar to meditation, and increasingly crafting is being used as a way to help people suffering from stress or mental health problems. Why do gardeners and florists regularly top the lists of people happiest in their jobs? Because there’s a real connection between a task and a visible outcome and in many cases the chance to be creative. I’ve found crafting with natural ingredients has broadened my ideas about what I might grow in my garden or on my cut flower patch. I now regularly include flowers which dry well alongside those I pick fresh. I also look out for plants with great seed heads which I can save or pretty leaves for pressing. For me it has also been a great way to beat those winter blues. Projects give the mind something to focus on as the light levels drop and by creating projects based on the seasons it has made me learn to appreciate what each season has to offer. I’ve always loved the weeks before Christmas and decorating my home but I can’t be the only one who really feels the gloom of January, the house bare after the winter festivities. But if you have some pots of paper white narcissi and flamboyant hippeastrums waiting in the wings to decorate a dining table or windowsill it’s amazing how they can lift the spirits and remind you spring isn’t far away. The Crafted Garden is divided into the seasons with projects inspired by the plants and countryside of each. And, because I’m a gardener and plant lover, each project includes details of how to grow plants which could be used in the project with some other recommendations too. 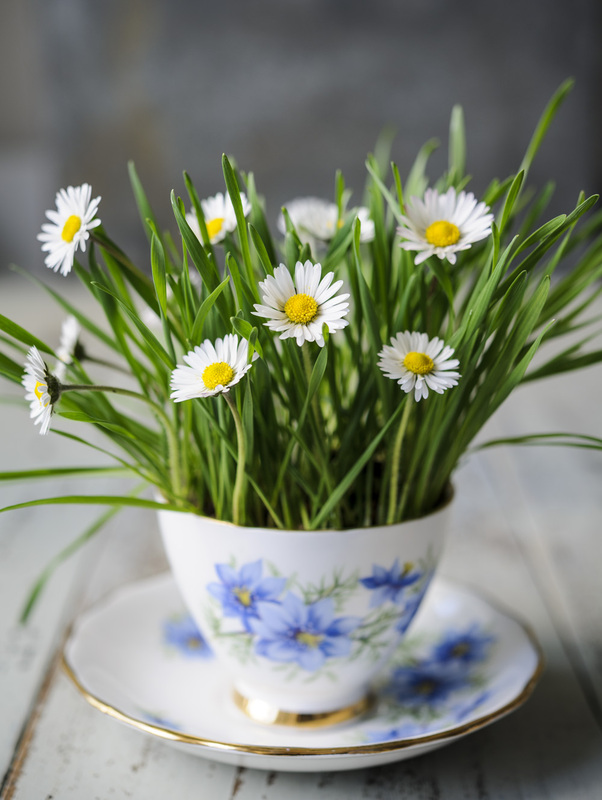 The projects range from ways to make your home look pretty, to floral fascinators perfect for a wedding or festival, with some ideas which would work as presents too. 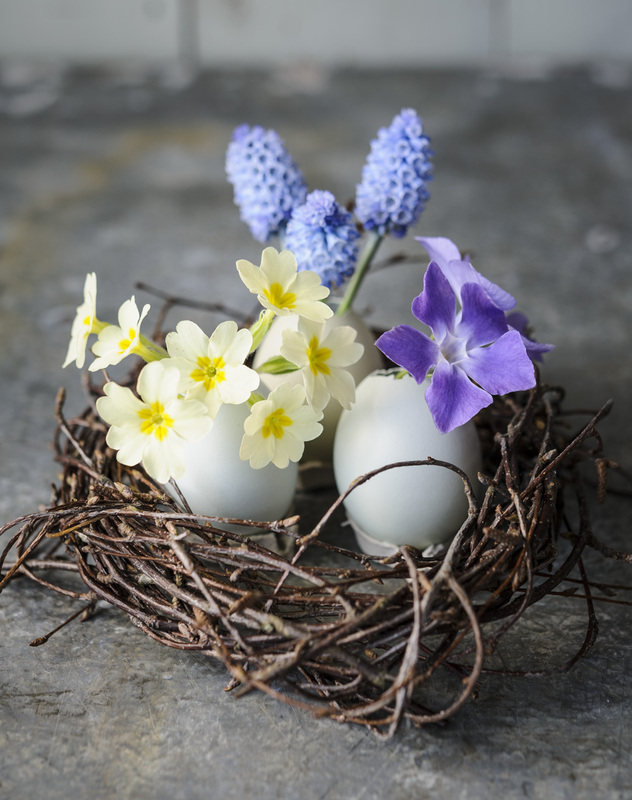 And there are ideas on how to craft and arrange flowers in a more environmentally friendly way. 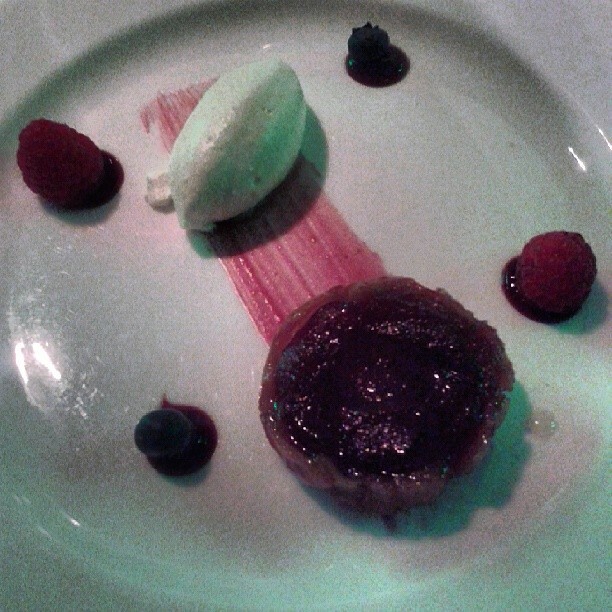 I’ve included a range of projects; some are very easy, others a little more complicated but still achievable. Lots of them are fantastic for crafting with children and inspiring them to appreciate nature. The Crafted Garden is published on 3rd September by Frances Lincoln and is available to preorder now from Frances Lincoln, Waterstones and Amazon. So the mince pies are made, the presents are all wrapped and under the tree, the fire is lit and there’s mulled cider on the hob. All that’s left for me to do, before I settle down to Carols From King’s, is to wish you all a fabulous Christmas. My regular readers will know I approach January with a certain degree of trepidation. It’s much easier to feel positive and optimistic when there are twinkly Christmas lights to brighten the short, dark days of winter. Mince pies and mulled cider help too. Then January arrives, the Christmas decorations come down, there’s the metaphorical tightening of belts as we recover from seasonal expenditure and the physical loosening of belts to cope with all that festive food. The sense of anticipation which accompanies the Winter Solstice ebbs away as I’m still scrabbling away in the dark when I get up on a morning. Something that has made a difference for me this winter has been the decision to grow indoor bulbs. This has been the first time I have managed to get my act together, remembering to not focus purely on spring and the outdoors when I ordered my bulbs back in the autumn. On the list were hyacinths, Narcissi ‘Paper White’ and ‘Grande Soleil d’Or’ and Hippeastrum ‘Red Velvet’. I was a bit dubious about whether I would like them or not so I stuck a tentative toe in the water and I didn’t go mad with the order. 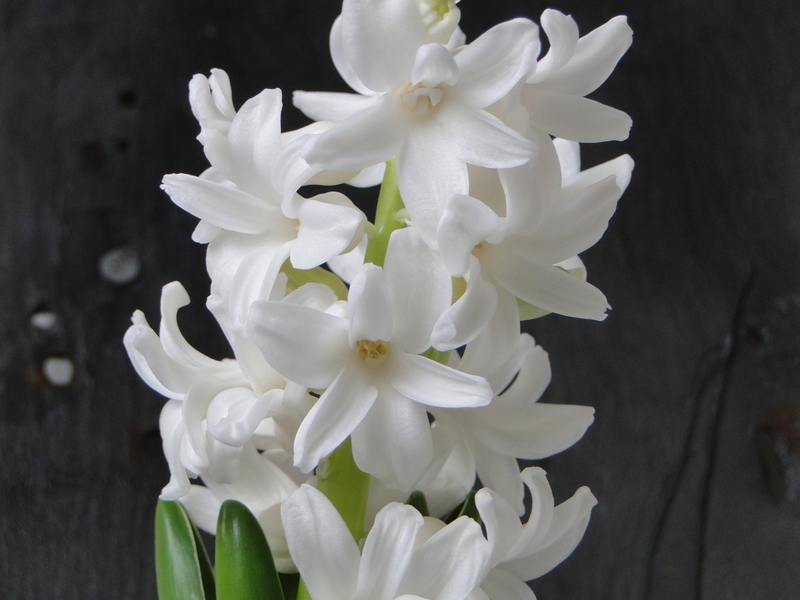 My reluctance partly stemmed from my dislike of probably the most popular of all bulbs to force, the hyacinth. They have always seemed funny plants to me. With their short stumpy stalks and fat stubby trumpet flowers they just look a little odd, particularly when they’re grown directly in the ground. Perhaps if the flowers were more delicate or their stems longer, but as they are they have never done it for me. 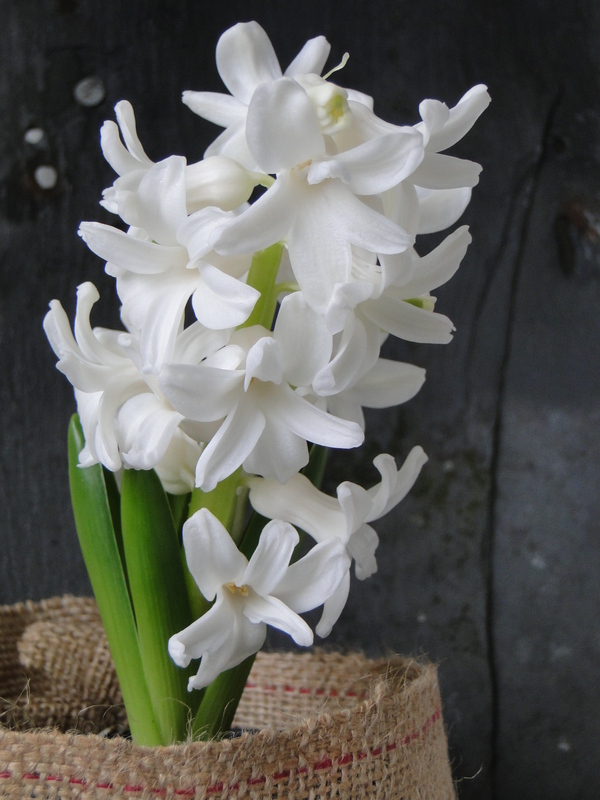 If Narcissi ‘Paper Whites’ are the Kate Moss of the bulb world, all willowy and sylphlike, then hyacinths have always seemed, to me, like a Les Dawson character, solid and stocky. Then there’s their famous scent. Potent is how I remembered it. My mum used to grow them, and with several on one windowsill I remember them being so overwhelming that a particular room was off-limits whilst they were in bloom. But browsing through the bulb catalogue back in August I thought I should give them another go. And I’m rather pleased I did because I have several in flower now brightening up the January gloom and filling my house with a delightful perfume. My selection of variety may have something to do with my new-found love of hyacinths. I picked the white flowering ‘L’Innocence’ which not only looks more stylish and modern than some but it also seems a little more delicate and a little less dumpy. As for the scent, it isn’t overpowering at all, and with the very occasional patch of sunshine or heat from the radiators warming the air the aroma is wafting through the house. So for bulbs indoors I’m won over but I remain to be convinced by them as additions to my borders. The hyacinths weren’t the first of the bulbs to flower with the Narcissi ‘Paper White’ timing their opening for my birthday in November. They are the most delicate of flowers with a sparkly sheen to their purest of white petals. 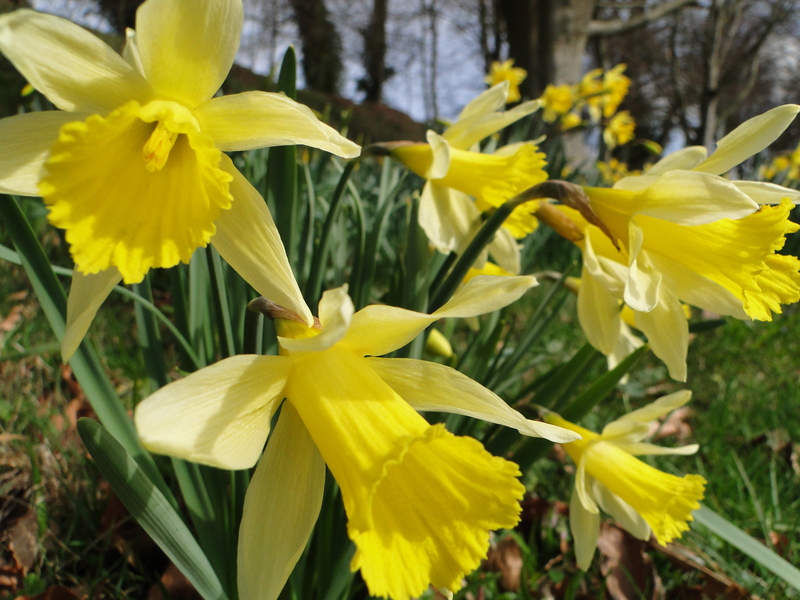 They are also one of the most perfumed of narcissi. The jury is still out on whether I like their scent or not. Occasionally I would wander into the kitchen and sniff the air and then start looking around for the offending aroma, checking the soles of shoes, emptying the bin etc, only then would I realise it was the narcissi. I have heard it likened to the whiff of cat wee before. But then there would be other times when it would smell completely different and quite beautiful. 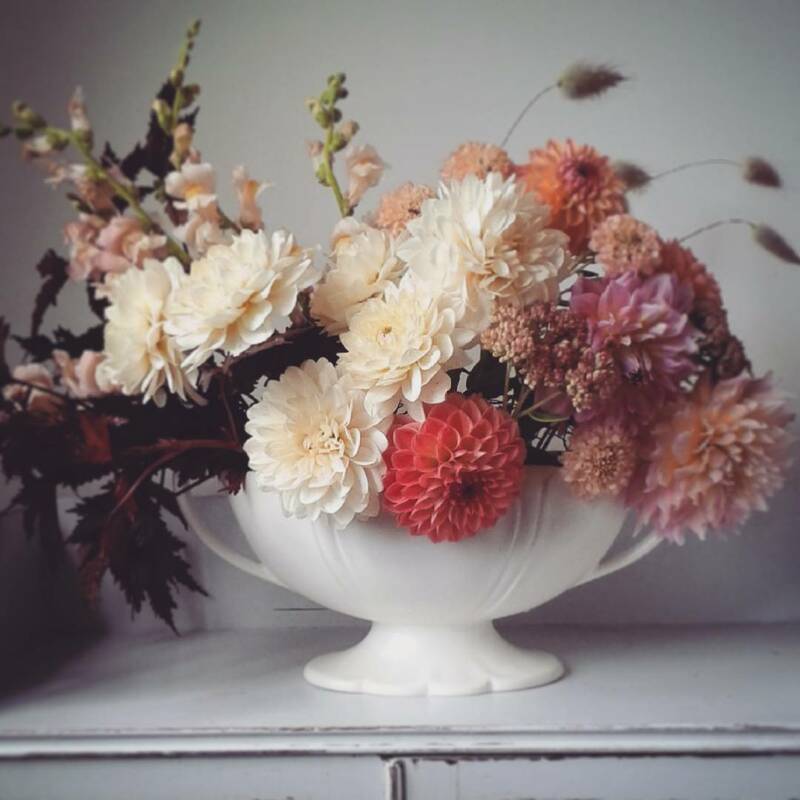 I’ll grow them again because they are so easy and home-grown flowers for a November birthday are too good to ignore. The winter blooms continued with my hippeastrum. Its huge bulb took a while to get going but then I dug out my heated propagator and sat the pot on the base of this. It wasn’t long before a green stalk emerged. It kept on growing and growing in a triffid-like manner. When it reached nearly 3ft it started to show signs of a flower bud. Slowly, four individual trumpet-shaped flowers appeared with them finally opening on Boxing Day. 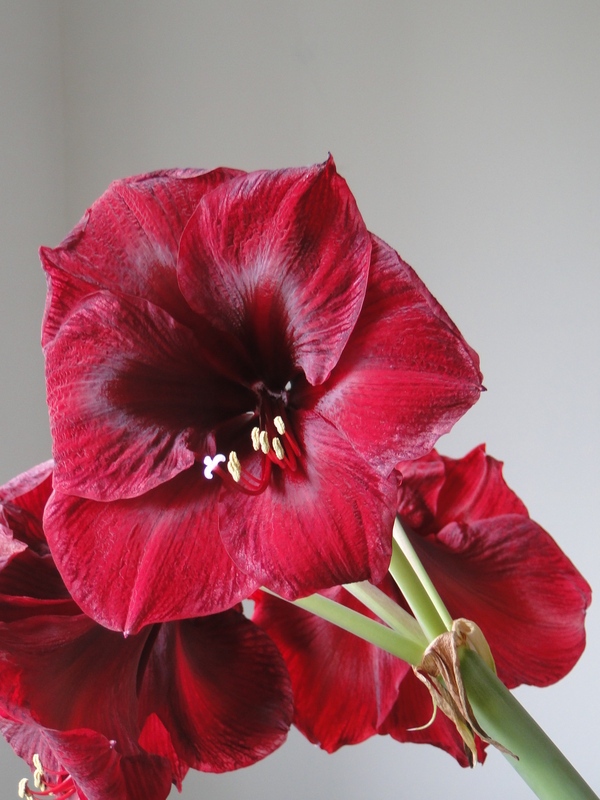 The variety ‘Red Velvet’ couldn’t have been better named or more suited to the Christmas period with its luscious and humongous flowers. It was fascinating to watch it grow because I had never tried it before, and there’s nothing like rekindling that child-like wonder by cultivating something new. I might look to see if there are any smaller varieties though as it’s tall and increasingly leaning flower stalk have given some cause for concern. In the greenhouse I have a large pot of Narcissi ‘Grande Soleil d’Or’ and some crocus waiting to be brought indoors. The extra warmth inside will speed them into growth for an earlier show and keep up the succession of winter blooms. And, whilst I’m waiting for the days to lengthen and the weather to improve, my indoor flowers are providing some much-needed cheer. I came home one day last week to find a package waiting for me. Inside was this delightful snow couple made by my very talented sister-in-law, Liz. They’re the perfect final touch to the decorations. Now I just need to do a spot of baking and wrap the presents, and of course, wish you all a very merry Christmas. The predicted storm has arrived here in Wales. There’s a howling gale outside and rain lashing down so I hope everyone stays safe and warm, and if the weather is making you feel a bit gloomy then I’ve included a link to a very funny version of the Twelve days of Christmas. It’s read by Frank Kelly, an Irish actor best known for playing Father Jack in the comedy Father Ted. If you’ve ever wondered what it would be like if all of those gifts over the twelve days actually turned up it could well be something like this version. Hope it makes you smile. Much as I have loved the mild weather we have had so far this autumn and winter, it hasn’t felt particularly seasonal. We have had only two real frosts up to now and I have had to keep reminding myself that it’s December and Christmas is not far away at all. I’m torn really, I’m not a lover of the cold, but I am a sucker for a Christmas that looks like the images on the cards – all snow-covered houses, frosty trees and smiley snowmen. I know the reality is somewhat different, our transport system grinds to a halt and our hospitals fill with people who have fallen over but two of the loveliest Christmases we’ve had were recent white Christmases. We were snowed in at my parents for one of them. We played scrabble, we read, made an enormous snowman and warmed ourselves in front of the fire. The other time we were at home. 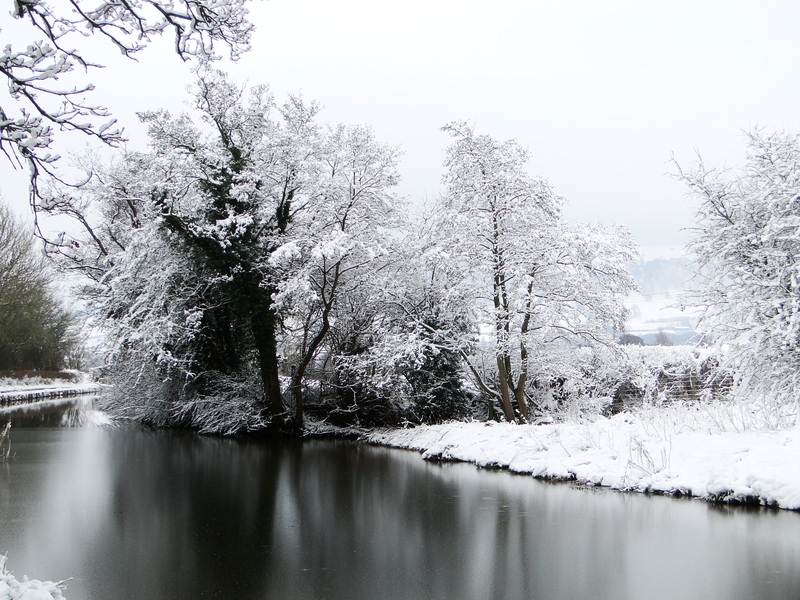 The countryside around us was under several inches of snow and looked like wintery perfection. We saw people skiing in the Brecon Beacons, watched birds skate on the frozen canal and followed animal tracks in the snow. Of course, once it’s no longer pristine white and turns to slush it loses its appeal, even for me. But, for just a few days everything looks magically different. And I think that’s why I love it so much, a touch of frost and a sprinkling of snow transforms the dull and drab landscape of our typical winters. 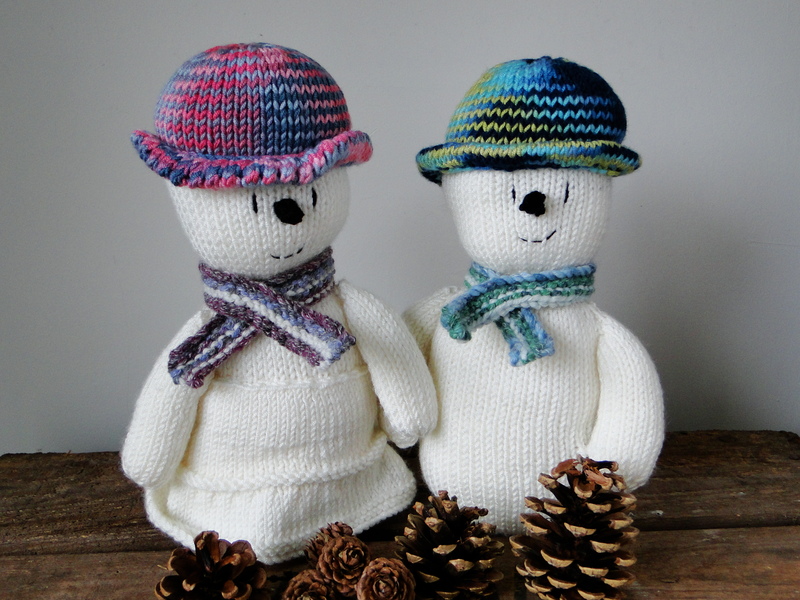 With little sign of a white Christmas this year I have been thinking of other ways to create that festive spirit. Upstairs, in my spare room, I have boxes of goodies, reminders of the summer that has gone. 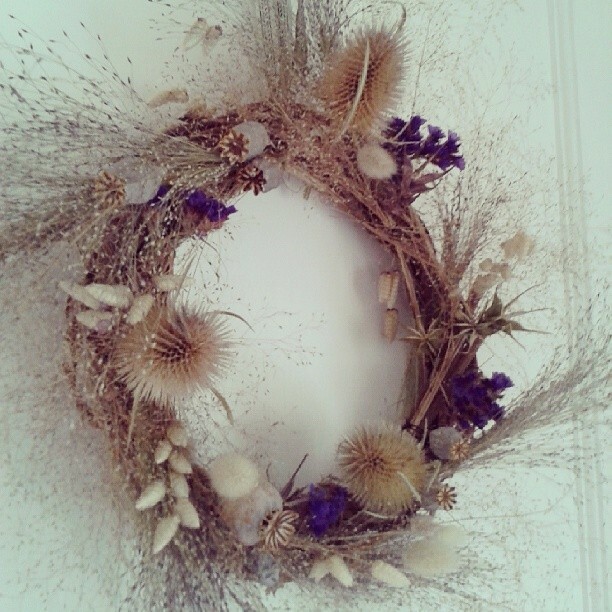 Dried flowers, seed heads and grasses are joined by bits and pieces I have foraged over the autumn. 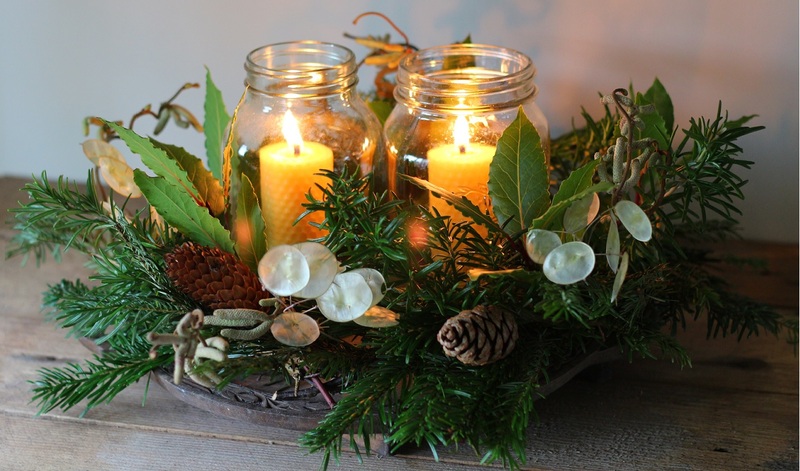 I have always loved using natural decorations, particularly at Christmas. I used to just pick up cones and wind-fall branches when I was out on walks but over the last couple of years I have started to grow plants specifically for drying and decorating. The collection has grown bigger each year, so much so I have often ended up wondering what to do with it all. Last year I was asked to do some flower arrangements for a dinner at Kate Humble’s rural skills farm. Problem was it was February and very much winter. Lets just say I was so very glad I hadn’t composted my honesty seed heads, grasses and teasels, as I had been planning to do the previous week. Jam jars of dried posies were delivered to them which were dotted about the tables, the honesty sparkling in the candle light. This year my stocks of dried material were even bigger. I couldn’t get into the shed at one point I had so many bundles of drying plant material dangling from the roof. And the gas man looked more than a little puzzled by the collection of plants hanging in the airing cupboard. Using dried material is a really useful way to decorate for Christmas in advance. Much as I would love swags of evergreens around the house throughout December, shrivelled, dry leaves wouldn’t be so appealing by Christmas. So I use my dried material throughout November and December and then add in the fresh pickings in the days leading up to Christmas Day. If you would like to see some more of my ideas for natural Christmas decorations, both dried and fresh, you might like to take a look at this month’s The Simple Things magazine which is out now. There were ideas in last month’s issue too which is still available to buy online. So the feature could be ready to be published in time the photographs were taken at the start of October. Wellyman LOVES Christmas, so I was surprised on the day of the shoot at how restrained he was. He didn’t greet the editor and photographer in a reindeer onesie with Wham’s Last Christmas blaring out, and instead settled for making Christmas tree-shaped biscuits, with a quick play of some carols on the piano. It was great fun making all of the decorations and fascinating to see the process of putting together a magazine feature. If you get the chance to see the outcome I hope you like it. For more information about The Simple Things. And here’s a peek inside this month’s issue. There are also a few ideas over on Wellyman’s own blog Pianolearner. I’m in a bit of a daze at the moment. Some of it is due to a lack of sleep. We appear to have mice or squirrels in the loft/wall cavities which sound like they are performing their own version of Strictly Come Dancing throughout the night, right above our bedroom. Wellyman and I weren’t keen on the idea it might be a rat so thought we’d refer to it as a squirrel in the hope that would make it all better when lying there at 4am listening to some hobnail booted creatures above our heads. But it turns out rats are preferable to squirrels on the sliding scale of unwanted creatures in your loft. Squirrels, according to the pest control guy, are the animal equivalent of a teenager left home alone. I’ve always had a soft spot for squirrels, even the unloved greys, but apparently they will cause a scene of devastation given half the chance. Not a particularly comforting thought as it seems, on initial inspection, unlikely to be rats. Lets hope for mice then, although it’s hard to imagine something which can squeeze through a gap as narrow as a pen can make so much noise that even Wellyman is roused from sleep. Only two hours slumber was probably not the best preparation for my day out in London last week. My publisher had invited me along to the Garden Media Guild Awards at a rather swanky hotel on Park Lane. So I ditched the wellies and jeans in favour of heels and a frock and headed east. The awards recognise the best in broadcasting, books, print, photography and online media in relation to gardening. Many of those attending are freelance so I suppose the event doubles as a bit of a Christmas do for those who wouldn’t otherwise get the chance to end the year with a bit of a party. Although everyone seemed much too well-behaved for it to resemble a true Christmas party. I wish I could post up some photographs but the ballroom was strangely lit with green lights. Maybe they thought it appropriate as we were all gardeners but it gave everything an odd Kermit-like tinge. It was lovely to meet up with fellow bloggers Michelle, Petra and Naomi. Alan Titchmarsh made an impassioned ‘I have a dream speech’ about the future of gardening and horticulture, Carol Klein looked very glamorous and Matthew Wilson managed to keep the post-lunch (and wine) audience under control. Dr Hessayon, he of the ‘Expert’ books fame, took to the stage to present an award and made a speech, a speech which was oddly misreported in several newspapers. There was much consternation on Twitter from those who had been there – had we really missed the standing ovation? Turns out you shouldn’t believe everything you read in the newspapers. I was really happy for Jason Ingram, who took the photographs for my book, when he won ‘Photographer of the Year’. Then it was time to leave; the matchsticks would hold my eyelids open no more. I did have to navigate a room of over 300 people with my goody bag first though. I’m sure the idea behind using a watering can as the receptacle for a variety of gardening related gifts rather than an actual bag seemed like a great idea on paper, the recipients were after all a group of gardeners. On the other hand the very long pointy spout was an accident waiting to happen. Numerous groins and a pregnant lady narrowly missed a poke from me but I thought it was safest to make my exit when I realised I had been stood with the spout only millimeters away from the ear of a man who was sitting down behind me. Still, I guess a watering can was an improvement on an axe, the gift given to all the guests a few years ago. Then there was the long trip home before heading off the next day on another long journey to visit family in the north-east for the weekend. And now I’m back home and it’s December and I feel completely unprepared for everything this month demands. The garden and allotment demand little or no attention at this time of year which is just as well really. I miss the fresh air and exercise of a morning spent gardening but I’m enjoying the break this year more than in the past. Scouring seed and plant catalogues and the internet for ideas for projects I’ll be working on next year is exciting but daunting also. Where will I fit it all? Am I biting off more than I can chew? There are the first signs of new life on the plot as daffodils poke through the bare soil, encouraged by the mild autumn. It’s surprisingly how the sight of just a few fat green shoots can spark a feeling of positivity and creativity but they did. It’s going to be a hectic few weeks but I’m determined to get out into the garden and have a poke about in search of new life. As we move closer to the shortest day it makes all the difference to my mood to be reminded spring won’t be too far away. There’s something to be said for blissful ignorance. There are so many forms of communication nowadays that being unaware of what is going on has to be a deliberate choice; don’t listen to the radio, turn off the TV and don’t read twitter. Take the weather for instance. The Countryfile weather forecast had set expectations high that a spell of good weather was on its way, the Indian summer I had been hoping for. For days though a thick layer of looming and oppressive cloud hung over this corner of Wales. The sense of disappointment was huge but it was made worse when I would hear reports of sunshine and warmth elsewhere. The thought that if we lived only 40 miles or so further west or north and I would be basking in glorious sunshine just made me feel as if I was missing out, rather like knowing there was a party taking place that I really wanted to go to but couldn’t be there. Much better to not know the party was going on in the first place!! Tuesday was another day that started off with a slate grey sky, the cloud was so low it was almost making me feel claustrophobic. Opening the curtains in the dining room I spotted a little mammalian treat left behind so thoughtfully by our neighbour’s cat. I made a mental note to tackle the mouse’s disposal after breakfast. Of course I got distracted and forgot entirely about the dead creature so inconveniently deposited just by the greenhouse. So an hour or so later, on my way to check my seedlings in the greenhouse, I stopped to see if our resident frog was poking through the pond weed. I knew instantaneously what the soft squishy thing was that I could now feel under one of my flip-flops and screamed. I had stood on the dead mouse. Poor thing! To add insult to injury the meaninglessness of its death, purely as a play thing for a cat that has no need for extra food as it waddles around the neighbourhood, had now just been compounded by the lack of respect my shoe had shown it. Despite the lack of sun I thought I’d better make the most of the fact that it was at least warm and start my bulb planting. I really dislike bulb planting. It’s hard work and the deferred gratification of having to wait until spring to see any rewards for your efforts doesn’t help. 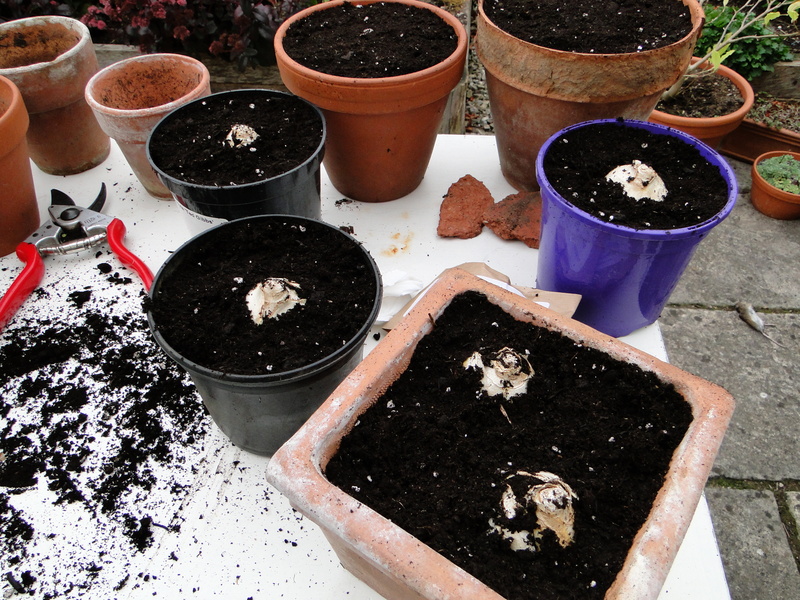 My strategy this year is to plant the bulbs in stages rather than in one mammoth session. This will hopefully make it all seem a less daunting task. The first of the bulbs to be planted were those I had bought to force for some early colour indoors this winter. I prefer to not give Christmas any thought until about mid-November, if I have any say in it but sometimes a little planning ahead is necessary and with my pots and bulb fibre ready I got planting. There were some paper white narcissus which should flower before Christmas, a multi-headed and highly scented narcissus called ‘Grand Soleil d’Or’, an amarylis and some Hyacinth ‘L’Innocence’, a beautiful simple white especially prepared for forcing. I haven’t grown any bulbs this way since I was a child, it was one of my mum’s rituals to plant hyacinths every autumn. I remember planting them in brightly coloured bowls and putting them under the bed in the spare room and checking them every week or so, waiting to see signs of shoots poking through. I never used to like the smell of hyacinths so it’ll be interesting to see if my sense of smell has matured at all. I’m hoping that planting these strongly scented bulbs isn’t going to make parts of the house a no-go zone this winter. The hyacinths need a spell in a cool, dark place to allow roots to develop. I simply covered my pots in the left-over bulb fibre compost bag and then put them in a cool spot in the house. I’ll check on them every now and again and when shoots start to poke through I’ll remove the compost bag and move them into the light. I planted them into normal plastic pots but the plan is to get hold of some zinc planters in the coming weeks. I think the combination of the white flowers and the silvery zinc will look quite festive. The daffodil varieties I’m growing, on the other hand, don’t need light excluding from them. So I’ve put the pots in a cool spot in the garden for now. As the weather gets a little cooler I’ll then bring them indoors. The amarylis needs warmth and light and is sitting in the greenhouse at the moment because of the warm weather but, as soon as the temperature starts to drop, it too will take up residence on my kitchen windowsill. You don’t need to use bulb fibre to plant up indoor bulbs, a multi-purpose compost mixed with some perlite to improve drainage is fine. Bulb fibre is best though if you’re using containers that don’t have drainage holes in them as it has charcoal in it which will keep the compost smelling fresh. I have, in the past, bought bulbs already planted up from the garden centre which are just about to flower but they do have a tendency to become very floppy. The low light levels of winter mean they strain for any available light and they are quite tall plants for a pot anyway. Garden centres often put a stick painted green into the pot to provide some support but it’s such an ugly thing and detracts from the beautiful flowers. So that’s why I spent yesterday weaving some birch twigs to create some more natural looking means of support for my home-grown forced bulbs. 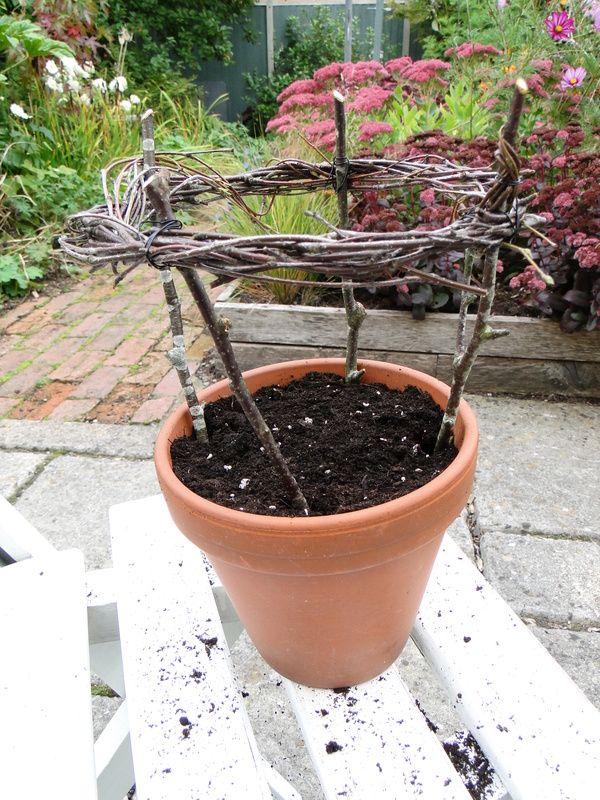 The birch twigs are brilliant and super flexible and the woven structures should do the trick. As the hours passed the sun did finally burn through the cloud, so much so that I was gardening in a vest top and shorts by the end of the day. Strange to think that these bulbs will be flowering in several months time when the warmth of summer will be a distant memory. Hopefully their flowers will brighten up those winter days. 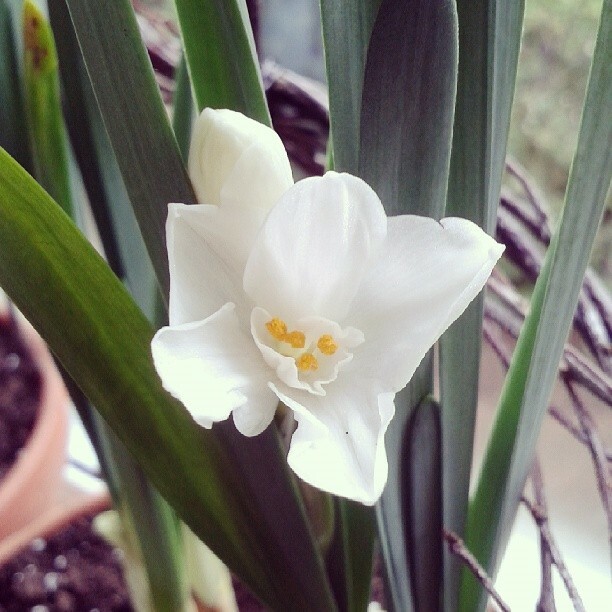 Does anyone else grow bulbs for indoors? I’d love to hear about your favourites.